Today is the anniversary of the Iraqi invasion of Iran. The depletion of the mighty Iranian army and the purges and executions of some of Iran's finest officers after the 1979 revolution had led the brutal Iraqi dictator, Saddam Hussein to believe that Iran will finally be a soft target for him. I remember the horror with which we received the news, the air attacks on the airport and the onslaught on Khorramshahr. What will happen if they strike at the refineries in Abadan? I thought with despair and anxiety. Yet the invasion consolidated the unity of Iranian people and epic after epic of courage and sacrifice ensured that Saddam's ambitions remained only a dream. 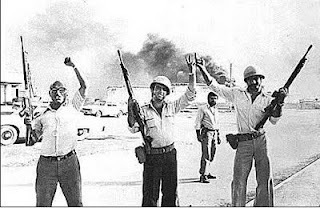 People of Khorramshahr fought and resisted the Ba'athist troops with tooth and nail for 34 days, day and night, non stop and in Abadan as the Iraqi troops came over their makeshift bridges they repelled them by fighting with everything they had and inflicted the first shock defeat against the Iraqi troops. 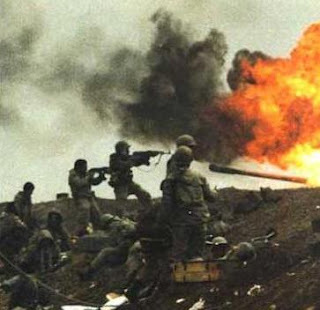 The war was unnecessarily prolonged however, Iran missed the opportunity of the best deal there was on the table by a broken Saddam Hussein, but the clerics were eager to establish an Islamic Republic in Iraq and many more lives were lost and the war ended without any compensation for Iran. All Iran's future generations will be in debt for the valour and patriotism of those who fell in this sacred defence and this week and we will rightly remember them alongside Iran's latest martyrs for freedom of Iran. Watching Saddam's stooge, George Galloway on Islamic Republic funded Press TV this week however will be like putting salt on our wounds. To think this lackey of Saddam is earning his wages with Iranian people's money is beyond belief. We never forget them and never forget the brutal Khomeinei. We always are proud of their blood poured on our homeland. This might be one of your bests posts, Potkin - well said and incredibly moving! Well said Potkin, we shall never forget their sacrifice. Galloway is filth, you're right, it truly is salt being rubbed into the wounds of the millions of people affected by this war. The War with Iraq which may have been imposed by the vicious dictator Saddam was the biggest crime of the Islamic Republic against the Iranian nation. That Iran survived at all was thanks to the countless sacrifices of her brave sons not to the evil Mullahs that made Iran isolated and vulnerable with their misguided terror and policies and prolonged the War needlessly in pursuit of their Islamic Empire. The real angels of Iran.We lost the best children of our country, especially those Khoramshahri's and Ahvazi's. They fought with their warm hearts to their last man.They did that for their homeland and not for Khomeini. It is still dificult for many many of us to forget this terrible war.